Transitions is called a conservatoire dance company, which means it renews its dancers each year within Laban’s MA Dance Performance program and is designed to help these artists ‘fill the gap between formal training and their entry to the professional world.’ The artists are selected ‘through an intense and competitive international selection process’ so on the one hand Laban seems to suggest the BA level formal training for these dancers — including those from Laban itself — is not sufficient to give them a competitive chance of joining a professional company upon graduation, and at the same time the formation of Transitions relies on the ability of these dancers to be so competitive in an international audition process to win a place in the company. The nature of Transitions — and of any conservatoire dance company — is thus somewhere between institutional and professional, and is essentially transient. The invited choreographers are not creating a repertoire that allows the company to mature and grow — there is no possibility of maturity and growth — but that enables the dancers to demonstrate what they have learned. One corollary of this approach is that all fourteen dancers are included in each work; no marked choreographic preference is given to an individual’s ability. 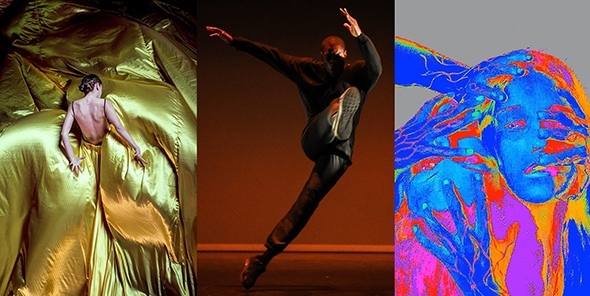 The qualities of individual dancers may shine in a given work but only in the sense of an accent of colour or texture in a choreographic quilt. In effect the constraints of these triple bills show not so much the possibilities of the dancers and choreographers as the nature of the MA Dance Performance program itself. This is certainly a more varied selection of works than last year and one that tests the dancers in quite different ways. Paradoxically, Jarkko Partanen’s work, Lovers, is the most challenging for its initial lack of any recognizable dance element. 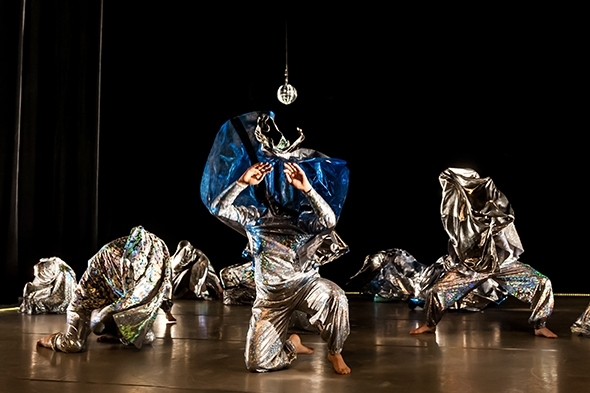 Partanen has organized the dancers ‘in such a way as to allow them to act, understand, and continue only through touch’ and in partnership with Laban’s Suzie Holmes has covered them in layers of foil and mesh that entirely obscure their identity; not only is their sight impaired but Partanen has evoked sightlessness in sculptural form. At the beginning there is an uncompromising lack of sound, too, leaving the audience to ponder in silence what appears to be a neat row of black plastic bags on the upper side of Fay Patterson’s square of floor lights. The initiation of movement is barely perceptible but as the dancers rise in their coverings Partanen’s vision is transferred to their sense of touch. Their challenge in subsequent couplings and grouping is to convey the sensory limitation as sensually and naturally as possible. When it is successful it is powerfully poignant, but if the level of gestural intention slackens or falters it can become comic. When a mirror ball descends and Rihanna’s Diamonds breaks the silence we feel a sense of relief as our sensory apparatus is restored but for the dancers the concentration must remain until the final, sightless exit. Hagit Yakira’s The Ar/ct of Moving Forward celebrates the freedom of movement as a mode of expression. The dancers initially walk or run in one by one from alternate sides of the stage; it is like a choreographic form of introduction, but instead of moving forward towards the audience they move away from it, from downstage to upstage, glancing back to look at us and to allow us to look at them. As one exits upstage another enters downstage in a mirror-like procession. The range of movement accumulates and accelerates over the course of the work, reveling in an abandoned enthusiasm that is contagious. As in Lovers, there is more to this choreography than the doing of it; it requires presence over reserve, connection over isolation, solicitude over individuality. The surge of Sabio Janiak’s upbeat score adds to the work’s sense of travel as bubbling pockets of exuberance explode and dissolve in a continuous stream of humanity. Richard Chappell’s When running starts and stops contains within its title a sense of what has gone before but introduces the articulation and flow of classical dance in an intriguing evocation of ‘animalistic physicality’. Created on eight dancers (there is an alternate cast of six with Orion Hart and Umut Ozdaloglu appearing in both) who form a band of friends caught up in a mysteriously undefined adventure, the work retains a muscular vocabulary that engages the dancers technically and allows individual expression within the whole. Albert E. Dean’s electronic score is implicated in the action like a ninth performer, playing counterpart to the physicality and marking the way forward, while Chappell’s choreographic grammar reveals a convincing ability to coax a story out of movement.